Pictured in pine with Black paint body and Medium Cherry stained top. Pictured in pine with Black paint body. Pictured in quartersawn white oak with Asbury Brown stain. The Breckenridge 50'' TV Stand is Shaker-style furniture with curves accentuating straight lines. Arch glass doors and arch panel sides distinguish the Breckenridge, while curved front brackets and Clydesdale feet round it off. The Bungalow Corner TV Stand has exposed mortise joints on the angular raised panels. Flush doors and drawer with chocolate knobs make create an elegant look. A classic living room would benefit from this heirloom TV stand. The 50"w Bungalow TV Stand is a great stylish upgrade for any modern day entertainment area. It's sleek and refined contemporary looks and it's timeless elegance earns this TV stand a place as one of our favorites. Perfect for medium size TV's. 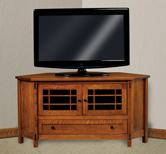 The Bungalow Tower TV Stand has elegant verticals and flush surfaces with exposed mortise accents. This TV stand comes with up to eight exposed shelves so you may store your family's media right with the TV. 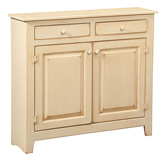 Up to four drawers and three doors provide ample space for consoles and accessories. The classic style and multiple functions of the Bungalow ensure that it will remain useful as technology changes. Heirloom quality features of this TV stand and shelves include solid wood construction with dovetail drawers and mortise and tenon joinery. Simplicity of design will make this TV stand look beautiful as your living room evolves. The Bungalow TV stand with Towers has clean mission lines and simple elegance which can be configured with or without towers. Pictured in quarter sawn white oak with Michael's Cherry stain and optional center door. Pictured in brown maple with Natural finish. The Centennial 36'' High TV Stand has Mission style features that suit it for a modern yet classic living room. Its shape boasts straight edges from top to feet, with exposed mortise joints detailing the corners. The central door is paneled while the two side doors have elegant narrow mullions. The drawers are paneled to match the middle door. This heirloom TV stand is wide enough for a 60'' TV and durable enough to last a lifetime. The Centennial TV Cabinet features four glass doors in front of one adjustable shelf for convenient storage of media and other entertainment and electronic accessories. Ths Centennial TV Cabinet is with bi-fold pocket drawers that fold and tuck along the inner sides of the cabinet when in use. The Arts and Crafts mission styling is simple, elegant, and versatile enough for nearly any blend of style. 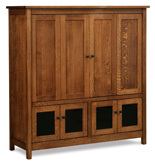 Use our drop down boxes at the top right of the page to select options for your Amish TV cabinet. The Centennial 60" TV Stand features an Arts and Crafts styling with old fashioned tenons which gives it a nice blend of classic elegance and contemporary character. 3 doors and 2 drawers provides ample storage space to organize entertainment media, game consoles and other related accessories. The Centennial 72'' 4 Door 2 Drawer TV Stand is a Mission-style classic with squared edges and reversed panels. Vertical mullions refine the two glass doors, while exposed mortise joints remind you that your heirloom furniture is built to last. All of our TV stands are handcrafted to Amish quality standards from wood harvested in the USA. The Centennial has an elegance that will keep it stylish as your home evolves with each generation. The Centennial Entertainment Center frames your TV in Mission style. Its squared edges and plain feet support a stereo cabinet with vertical mullions in its glass door. The four drawers have reverse panels. The Centennial's open TV space offers four luxurious folding doors that are also reverse-paneled to complete the solid wood look. This heirloom quality entertainment unit will be the centerpiece of a living room and will define your classic space with hardwood style.